Have you ever wondered what happened to the shipwrecked S.S. Minnow? Put your mind at ease…you’ll find it aground…on the shore at Gilligan’s. …located in the heart of the Laughlin community, where Casino Drive meets Needles Highway. Although you won’t find any of the castaways, you can sit right back and take in the comfortable, serene setting of our local “tropic island nest”. 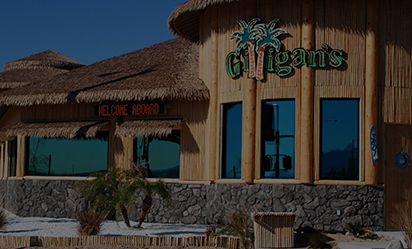 The interior of Gilligan’s, with its many photos, island artifacts, bamboo, and imported bar canopy, will tell the tale. Enjoy a cocktail on our “uncharted desert isle”, while taking in the view of the famous Colorado River through large aqua-tinted windows. Watch your favorite sport on one of our four 50″ LCD TVs, play some tunes on our Touch Tunes juke box, or indulge yourself with a little gaming on one of our 15, state-of-the-art Video Poker machines. Whether you want to set sail for just a three hour tour, or want to be stranded for a while, be sure to put Gilligan’s on your list of “must see” places to visit! …and as always…FREE DRINKS TO PLAYERS.!! !